People who drink before reaching the minimum legal age for consuming alcoholic beverages engage in something called underage drinking. This phenomenon is unfortunately increasingly popular these days as a plethora of teenagers, and young adults try to consume alcohol at parties or various social situations. Underage drinking is not something to play with as alcohol can have damaging effects on the health of a particular youngster, affecting the brain and neurological activities. At what age is it legal to drink in the US? Where does underage drinking take place? What are the effects of alcohol abuse on a still-maturing brain? What are the dangers of underage drinking? 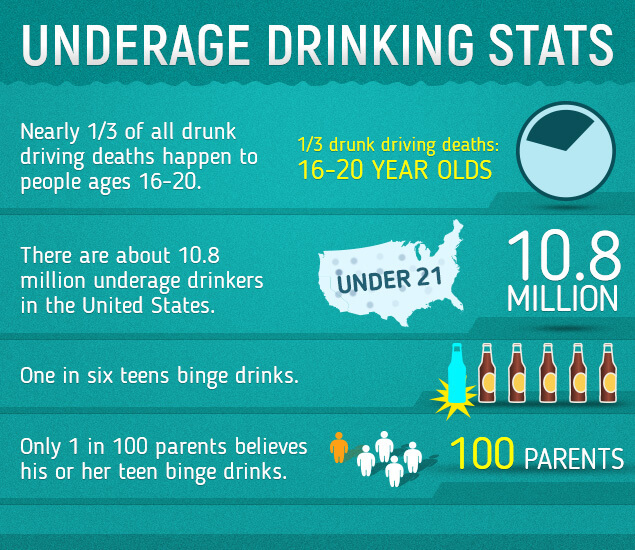 What are adolescent drinking facts and figures? What Is The Minimum Legal Drinking Age In The United States? At the moment of this writing, anyone who wants to consume alcohol in the United States of America needs to be at least 21 years old. This limit is enforced to reduce the number of car accidents which happen as a result of drinking and driving as well as to protect kids from teen drinking, and the dangerous effects alcohol can have on their health. Back in the days, underage drinking in the US happened if the teenagers were younger than 18 years old. The authorities have increased this age up to 21 years in an attempt to prevent a multitude of road accidents in which drunken teenagers are involved. These accidents usually have bad consequences such as major injuries and even death. Unfortunately, some experts agree that increasing the minimum legal drinking age was a mistake as plenty of teenagers still hide indoors, drink wine alone, and get drunk regularly. There is a debate on whether the drinking age should be decreased back to 18 as it was almost 30 years ago, to lower teenage drinking cases. The other factor is that adolescents can easily find out the ways to get drunk without alcohol, which can prove even more dangerous than drinking. Where Do Teenagers Hide to Drink Without the Supervision Of Adults? Since it is illegal for people younger than 21 years old to drink, teenagers usually find other methods to avoid the law and indulge in bad drinking habits. Adolescent drinking usually takes place behind closed doors, in basements, private parties or fraternity homes. In some cases, especially when speaking about the family of alcoholics, older adults procure drinks which will be shared with teenagers who are not yet legally allowed to drink. Whether teenagers drink at 18 or 21 years old, the effects of alcohol can still be devastating if this substance is abused. At this fragile age, the brain is still in a developing process and alcohol can seriously impair cognitive functions during such social drinking. Even drinking too much beer can cause irreversible changes in brain development. Upon entering the organism, alcohol is absorbed up to 20% by the stomach, and the rest of the 80% is processed in the small intestine. Regardless of what type of beverage is consumed and its particular alcohol percentage, the total alcohol concentration in the body is the most important aspect to consider when it comes to the effects of underage drinking, especially for people who want to drive after consuming alcohol. After it has reached the small intestines, alcohol will quickly travel to the brain and affect the communications between nerve cells. The under age drinking consequences are very varied and can lead to difficulties in maintaining balance, making poor decisions, having slurred speech, developing alcohol-induced depression, etc. Since the brain has many areas, alcohol can interfere with the neural activity in each one of them, resulting in different characteristic behavior patterns such as talking too much, getting overly emotional, getting angry very quickly, having insomnia after drinking alcohol, etc. What Are The Effects Of Excessive Alcohol Consumption On A Developing Brain? Too much alcohol can affect the brain in many ways. This substance limits cognitive functioning, alters anger levels, balance, speech and thinking abilities. Teenagers who engage in underage drinking are more likely to make bad decisions, spend money unwisely or become violent and extremely aggressive with those surrounding them. Some of the unstable teenagers even turn to suicide by alcohol attempts. Since the brain is still developing between the ages of 21 and 25 years, young adults who abuse alcohol might have serious health problems later on. The consequences of underage alcohol consumption can affect anyone regardless of gender, age, ethnicity or body type. How does alcohol affect the brain specifically? One of the most important brain components is the cerebral cortex which controls senses and inhibitions. When people drink too much, this brain part is affected by alcohol which makes drinkers less inhibited and more prone to make poor decisions and judgment calls. Alcohol kills brain cells, roughly speaking. This lack of inhibition and fear is very attractive to teenagers, and usually, it is the primary reason why youngsters drink before they reach the legal drinking age. While still at puberty or developing into young adults, teenagers are usually under a lot of social stress from their peers, and this might be one of the most important causes of underage drinking. Other important brain components are the frontal brain lobes which are responsible for self-control. If one gets inebriated, alcohol can make the person in question more likely to act on urges, become very aggressive all of a sudden or make wrong snap decisions. The cerebellum is a brain part responsible for coordination, and it is also affected by alcohol. People who abuse this substance will eventually feel dizzy, have poor eye-hand coordination, are more likely to trip on things or accidentally hit objects with their hands while gesticulating. This is one of the most common of the under age drinking consequences. What is the effect of underage alcohol consumption on hippocampus? The hippocampus is responsible for storing memories, and it is another brain part which can be affected by alcohol. It is common for people who get drunk, regardless of their age, to forget things or have difficulties remembering situations, people or conversations. The hippocampus is affected even by small amounts of alcohol, and in serious acute alcohol intoxication cases, blackouts can occur which produce great damage to this brain area. If the hippocampus gets permanently damaged as a result of excessive underage drinking, one can have problems remembering or learning new things throughout his life. How does teenage drinking influence hypothalamus? The hypothalamus can also be affected by too much alcohol, and this brain part is responsible for regulating body needs such as thirst, hunger, the need to urinate, etc. That’s why many people become extremely hungry and/or thirsty after consuming a lot of drinks, not to mention that alcohol also dehydrates the body. The underaged drinking consequences can be even worse as the hypothalamus is also responsible for monitoring heart rate and body temperature. If one drinks too much, the heart rate can increase considerably while the body temperature drops to dangerous levels which make abusing alcohol during very cold weather a serious risk. What Are The Effects Of Underage Drinking? 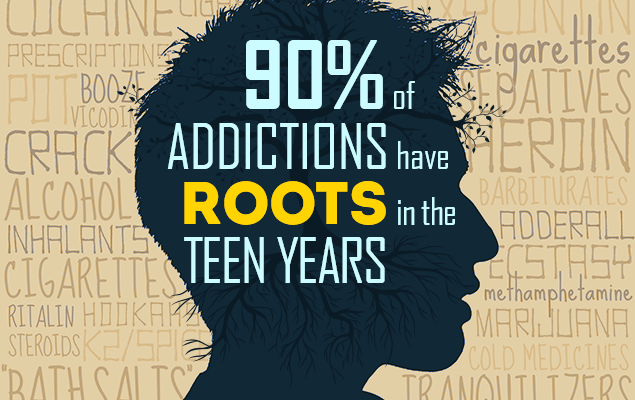 Teenagers who abuse alcohol can pose serious problems to others and themselves as well. For example, drunken youngsters can become aggressive if police officers question them. These teenagers can also be violent among themselves or become aggressive with neighbors, parents, and relatives. Even teenagers who are known for getting excellent grades can make a 180-degree turn in personality and become susceptible to poor judgment calls. These are just a few negative consequences as a result of teens drinking alcohol, and they can have lasting effects on their lives and the lives of their parents. Alcohol and diabetes also have a proven connection. Luckily, there are numerous signs of progress made on how to stop underage drinking and a plethora of parents collectively engage in educating kids and focusing their attention on less destructive behaviors such as sports, music, etc. It is important to start alcohol abuse treatment before the situation became worse. The early interventions tend to be very successful with the help of the alcohol treatment centers medical professionals.